I was thinking of Obama and McCain the other night, and how they seek our allegiance and then, all to often, abuse it with the whispers in their ears from lobbyists and advisors and others. I always worry they will just disappoint me again. (You can hear my youngest son in the background, talking and singing his own song and then at the end, asking me to play it again. Very funny). 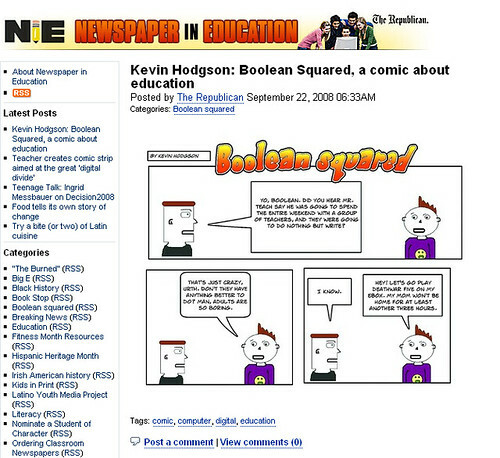 This week’s Boolean Squared comic strip was just posted over at site of The Springfield Republican newspaper. This week, the comic explores China, filtering and the dancing chicken video (hmmm). You can also subscribe to the RSS feed for the comic that will be published every Monday morning. Just click here to gather the RSS feed address. Yesterday, in hopes that it would draw my sixth grade students’ attention to the first presidential debate, we did some work around thinking about the elections. Our school will be doing a Mock Election for the first time (ever?) and I am determined to provide my students with enough information to not only make a good choice but also to filter out the influence of parents, teachers and others (yeah — this is going to be tough). I started out the lesson with this great video from Common Craft and we talked about the complicated voting system in this country and why that is important (and the day before, we chatted about the balance of power among the branches of government). Next, my students did some stick figure drawing for a comic strip in which they, as a comic character, ask a question of the candidates. We then moved onto the computers and headed off to Make Beliefs Comics, which is an easy and isolated comic strip making site. They loved it! The comic site is limited in scope, but you can email the link to the comic and I intended to take all of the comics and use Google Sites to create a little website of their comics. BUT — the Make Beliefs site has something strange going on with scripts (I emailed the creator, Bill, and he is working on it — he is very responsive). So my web idea will have to wait and I hope they get it all resolved out very soon. 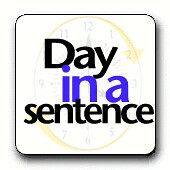 The themes for Day in a Sentence continue, with this week focusing on poetry. (I know it’s not April and that is the point — poetry should be enjoyed in all forms all times of the year). I ask you to consider reflecting on a day of your week in the form of a poem. It could be a couplet, a haiku, a freeverse or any style of poem that suits your fancy. Just add to the comment section of this post and I will collect and publish over the weekend. I look forward to the rhythm (and maybe rhyme) of your words. The Common Craft folks have done yet another great video — this time, it’s on searching the web. So, today, my webcomic — Boolean Squared — got published on the website of the big regional newspaper and my venture into the world of creating comics is official. The newpaper (The Springfield Republican) also printed a short story in its paper version about the launch of the comic, so we’ll see where things go and how they develop. I also set up a virtual storefront for Boolean Squared Swag through Cafe Press, just to see what might happen. (Check it out if you get a moment). I love the fertile imagination of my students. Give them a push and they leap forward. I presented them with a prompt in which they had to create a Vehicle of the Future that would run on something other than fossil fuels. This led to an interesting talk about the Earth’s resources and innovation. Then, they got to work, using informational text/expository writing to label and explain their vehicles. I took their images and went into Animoto and … came up with this. I showed it to my students today and they were enthralled with it (and a few who had not yet finished their vehicles are now inspired to complete it soon before I do a revision of the video).